Preheat oven to 350. Heat a small amount of oil in a 12-inch cast iron skillet. Brown the sausage on all sides.Whisk together the eggs, spices, milk, set aside. Add the okra, peppers, onion, and corn and sauté until the onions are translucent. Remove the sausage and vegetables from the pan and place in a bowl. Cover. Arrange the potato in single layer in the bottom of the pan. Cook for 3-5 minute or until beginning to brown. Layer the vegetables on top. Add the egg mixture. Use a spatula to create a smooth, even layer. Keep on medium heat and cook until just beginning to set. Bake about 10 minutes or until the top is just beginning to brown. Remove from pan and slice. *Defrosted frozen, plain shredded raw potatoes (sometimes labeled for hash browns) work well here. We were at the local farm store this weekend and they had the prettiest okra, I just had to pick some up. I had no idea what to do with it but it looked so good! When I got home I realized I had a dozen eggs and some leftover frozen andouille from an earlier recipe and the answer was clear: frittata! 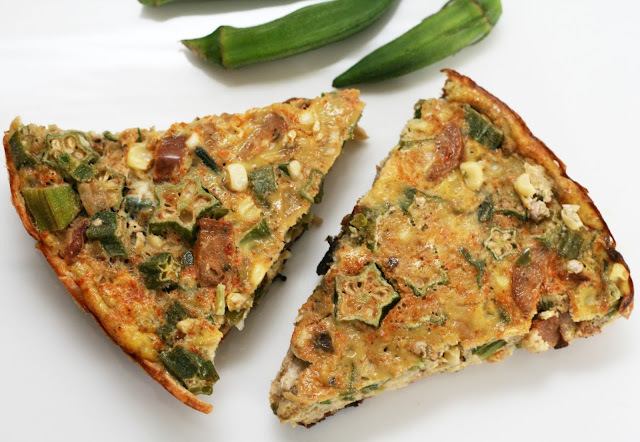 Frittatas are one of my favorite things to do for an easy dinner and the fact that you can toss pretty much anything in and have it taste amazing. Since I had andouille and okra, it was clear it need a Cajun bent so I added onion and shishito peppers (for more heat use jalapenos). Matt had the idea of making sort of a potato crust so I lined the bottom of the pan with potato. It added a lot of texture interest and kept the egg mixture of sticking to bottom of the pan, something I always worry about with frittatas.